This entry was posted on Tuesday, December 9th, 2014 at 3:01 pm and is filed under books, dialect, language, linguistics, usage, writing. You can follow any responses to this entry through the RSS 2.0 feed. You can leave a response, or trackback from your own site. Thank you, Stan, for including the outsider as a norm within society. Yeah, he do. I like. Maybe I gotta read some a his books, too. But he does get one other thing wrong: Sign languages are not one-handed. “she raised her right hand and quickly told him…” led me to expect her to be fingerspelling, not signing. Vinetta: All credit to McBain. WWW: He’s not to everyone’s taste, but if you like tough, lean, unpretentious crime fiction, you can do much worse. esampson: It’s a pretty good book. thnidu: Not necessarily. I wondered at first if he meant fingerspelling, but as I understand it signing is sometimes one-handed, whether through necessity or for circumstantial reasons. I did my graduate work and wrote my dissertation (UC Berkeley) on ASL. Yes, signing can be one-handed. But the amount of material covered in this long utterance is very unlikely to be given by fingerspelling English, unless the narrator doesn’t know ASL – and he’s already told us that she’s using the [nonexistent] “universal language of deaf mutes”. Also, raising the hand is strongly indicative of fingerspelling rather than signing. Since the manual content consists almost entirely of rapid changes in handshape, the viewer has to keep their eye directly on the hand or close to it. And since a lot of information is conveyed on the face even in signing, let alone silent mouthing (common though not universal with fingerspelling), the hand has to be closer to the face than is usual in signing. So the evidence is extremely strong that McBain was not distinguishing fingerspelling from signing, as well as not realizing that SLs are as different as spoken languages – though that doesn’t reduce the props due him for having a signing deaf character in here, and as the narrator’s beloved wife. Thanks again for this post, and the whole blog. 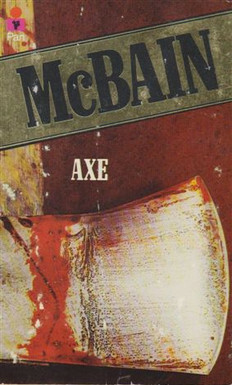 I’ve read most of McBain in my time, and enjoyed it: although grim at times, his books don’t have the determination to sell via abominable shock and gore that is characteristic of more current authors. And, as you say, he has a deft touch with words. Mise: Yes on all counts. Another appealing trait is his ability to tell a decent story in 150–200 pages. Not every novel needs to be a sprawling, five-act saga. thnidu: Agreed, and thanks for the expert analysis. It does seem as though he wasn’t distinguishing between sign language and fingerspelling. If I read further accounts in his other work, I’ll update this post. I think you may have introduced me to something special, I had never read ANY Ed McBain and have looked into him a little since reading your blog. I like his style, save for the ellipses; I always prefer the good ol’ dash! One thing I think NZ has got right is making NZSL one of our three official languages, and there is now a petition circulating to have it taught in secondary schools. No one is gonig to get arrested for signing here, but if they did, at least they can insist on the court proceedings being signed. Thanks too to thnidu for the commentary on the differences between ASL and fingerspelling. Fingerspelling is almost non-existent among users of NZSL from what I’ve seen, and from discussions with friends who are fluent in NZSL. The perception here is that finger-spelling is closely identified with ASL, being considered a distinctively American practice. I don’t know much about Auslan, but I have a hazy suspicion that finger-spelling is not as common among its users as it is perceived (perhaps incorrectly) to be among ASL users. Jim: I favour the aposiopetic dash too, though I’ve used an ellipsis for particular kinds of interruption – I like to keep my options open. :-) Enjoy McBain. Stuart: That’s a bizarre case. How could the school be so ignorant? At least they later reversed their decision, but it’s worrying that they even had to. I recently edited a dissertation that looked at disability rights in different countries (and their adherence to the CRPD); it singled out New Zealand as a good example, owing in part to its comparatively open style of governance and the fact that the disability rights movement is less fragmented there than in other countries. Naah, dis is Philly. Dat’s in Cavanaugh’s voice. On the subject of SLs – what verb is preferred to describe communicating through SL? With spoken languages, one ask “do you speak (x)?” ” They’re an L1 speaker” etc. Since I’m ignorant of the culture, I’d like to use the verb preferred by those who aren’t. They were [using / speaking / signing in] LSF,* and while I got some signs here and there I couldn’t really understand what they were saying. Thank you for being concerned about it and asking.